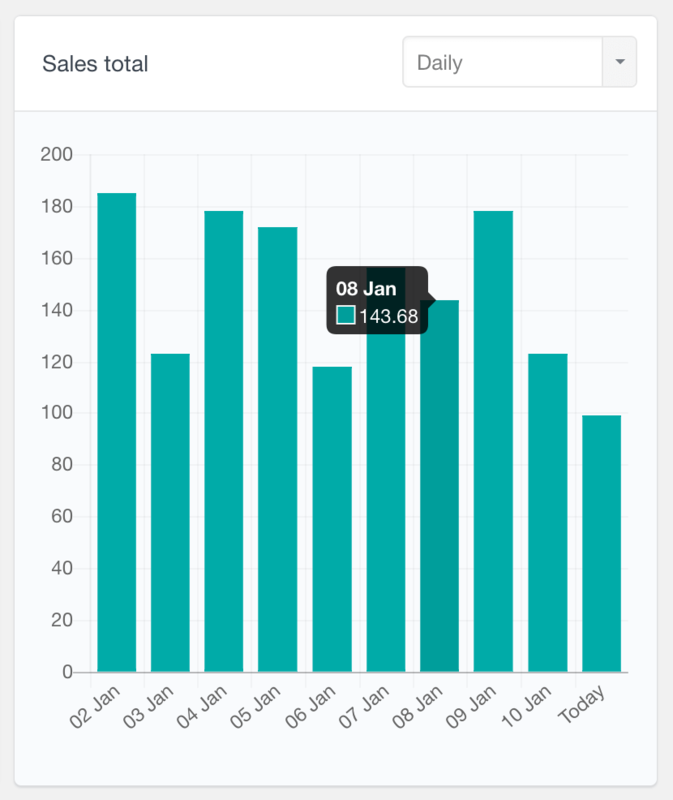 The WooCommerce module of Users Insights comes with its own Reports page visualizing your sales and customer data with interactive charts. 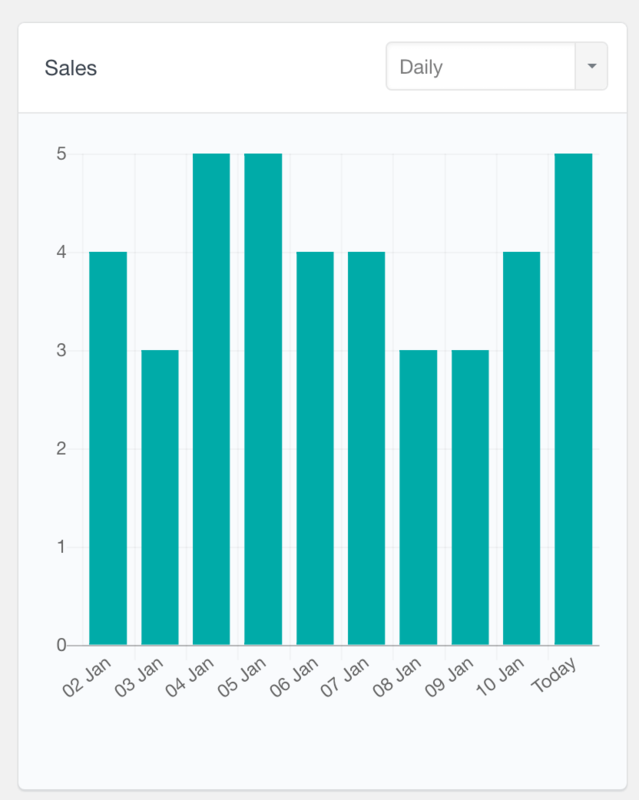 In addition to the various filters and customer profile info that this module provides, the WooCommerce Reports feature can help you further analyze your store’s performance by turning your data (customer behavior and WooCommerce sales) into actionable insights. By unifying your WooCommerce customer data and turning it into visual reports, Users Insights gives you a clear picture of your business performance and the leverage to use your customer data to make data-driven decisions. 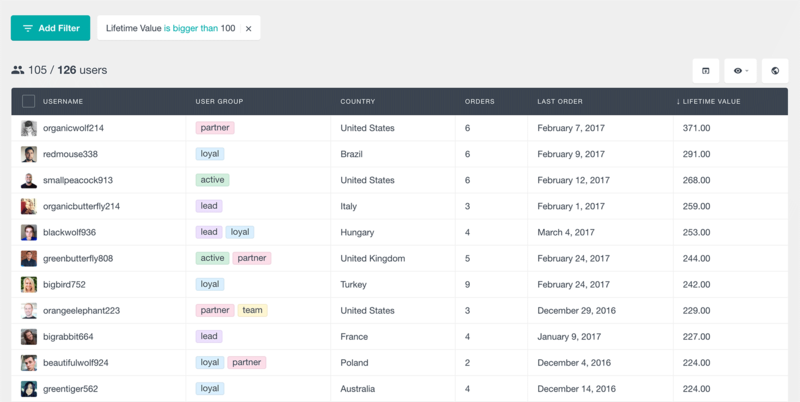 Unlike the Users Insights table and filters that are designed to work with WordPress users only, the reports feature shows both user and guest data. The reason for this is that the reports mainly show order related data, which might not be necessarily linked to users. 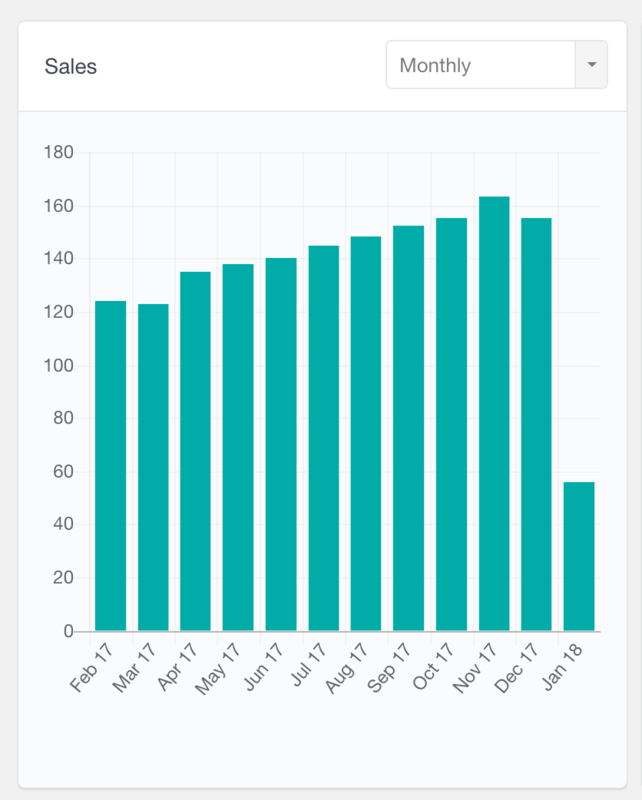 The Sales Report shows the number of sales made over time. You can see the number of sales made in the last several days, weeks, months or even years. This report can best show you how your store is performing over time. An order is considered a sale if it has one of the following statuses: Completed, Processing or On hold. 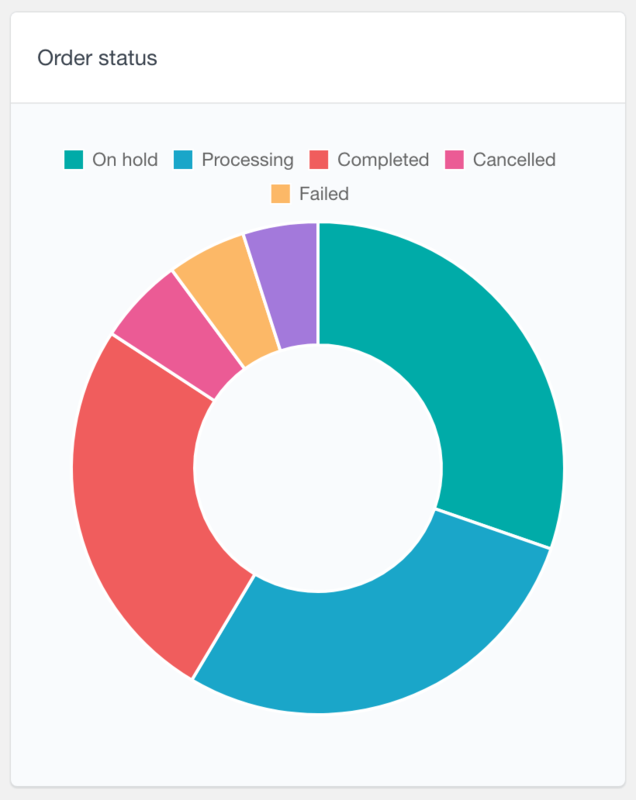 In this way, orders that are cancelled or failed are not counted, so you can only analyze the successful orders. This report represents the total amount of the sales made for the selected period. As we mentioned above, we consider a sale every order that is in a completed, processing or on hold status. Therefore, this report reflects the total amount of these orders (please note that partial refunds are not deducted from the total amount). While the number of sales can show you the overall buying activity on your site, the sales total report can be useful to analyze the financial performance of your store. 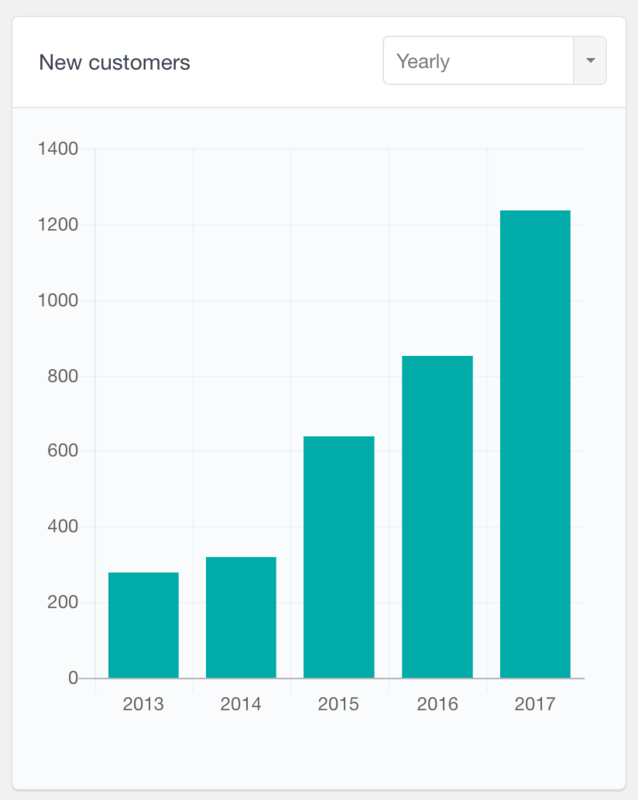 The New Customers Report can show you the number of new customers acquired over time. 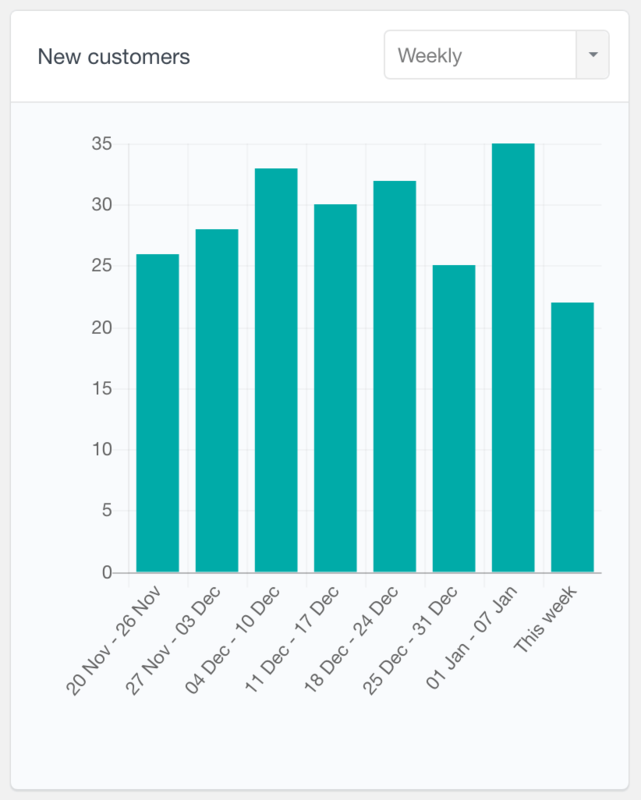 This is a bar chart report, supporting daily, weekly, monthly and yearly reports. A new customer is considered anyone who has made their first order within the selected period. Therefore, this report would only show you the number of first time buyers and depending on the nature of your business and your repeat customer rate, it might actually be different than your sales report for the same period. The number of orders per customer is a pie chart report, that can help you visualize the percentage of your repeat buyers. With this report, you can easily see how many customers you have with one order, two orders, and so on. Additionally, this report allows further filtering the orders by their status, so for example, you can see the number of completed or refunded orders only. As its name suggests, this report will show you the top billing countries based on your WooCommerce orders. 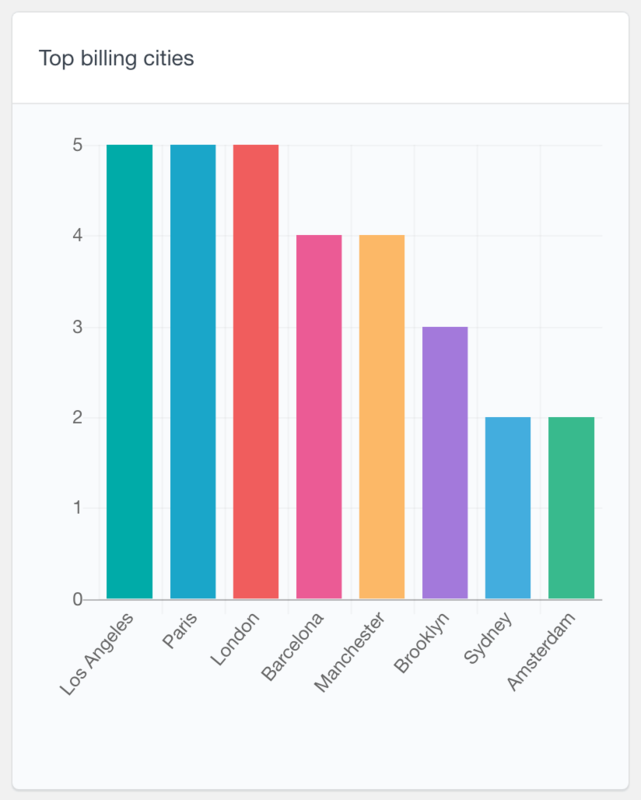 The report is available as a bar chart, by default displaying the top 8 countries. The billing countries report can help you understand where most of your customers come from and improve your services and products accordingly. 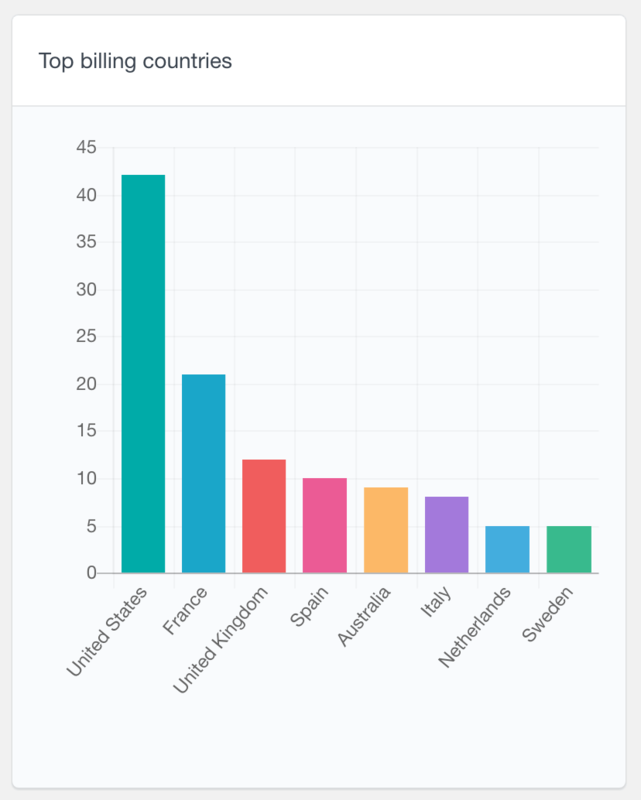 Perhaps you could create translations of your stores’ top countries languages, which can further increase your visits and sales from these countries. Or you could use this information to further optimize your marketing strategies. Similarly, reports are also available for the top billing cities and states. These reports can be most useful if your business operates within a single country. You can see which regions most of your customers come from, which can help you make demographic based decisions. For example, if you find that you have a large number of customers coming from a distant region, you may consider opening a storehouse in that area, in order to provide more affordable shipping options and faster delivery. 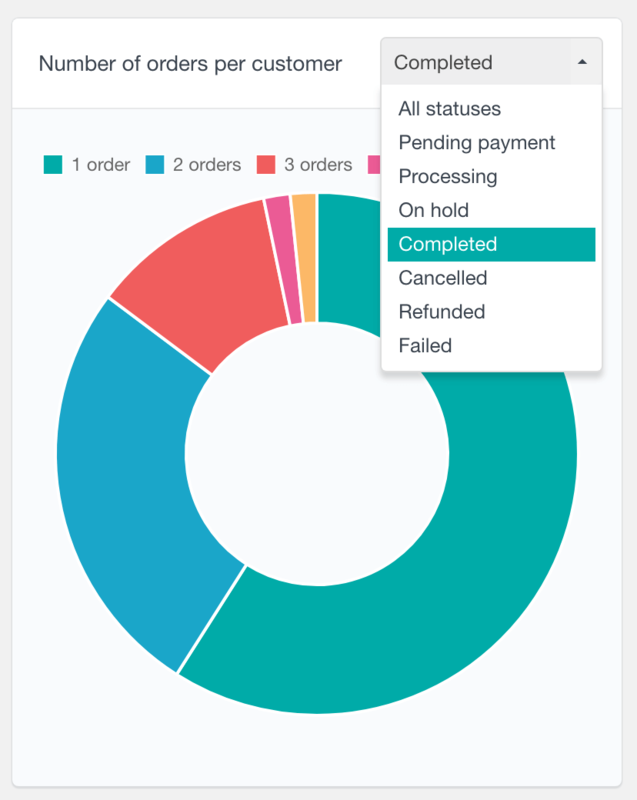 Another report that the WooCommerce module provides is the Order Status report. 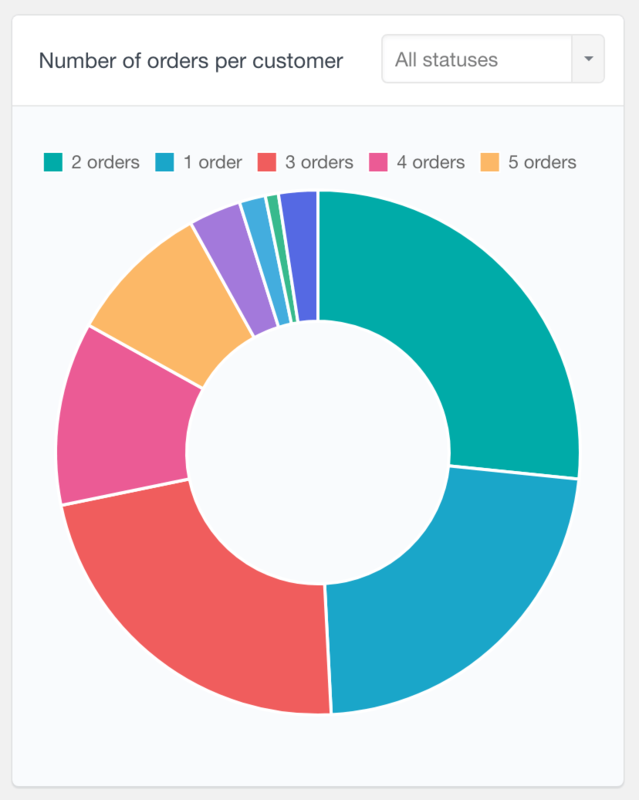 It is available as a pie chart, visualizing the number of orders from each status. With this chart you see what portion of the orders have not been successful or are on-hold, and try to minimize these numbers. For example, you might find that there is a larger number of failed orders than you thought. Perhaps you could try to figure out why this is happening or introduce more payment options in order to minimize the chance of a failing order. This could therefore increase your successful orders percentage over time. 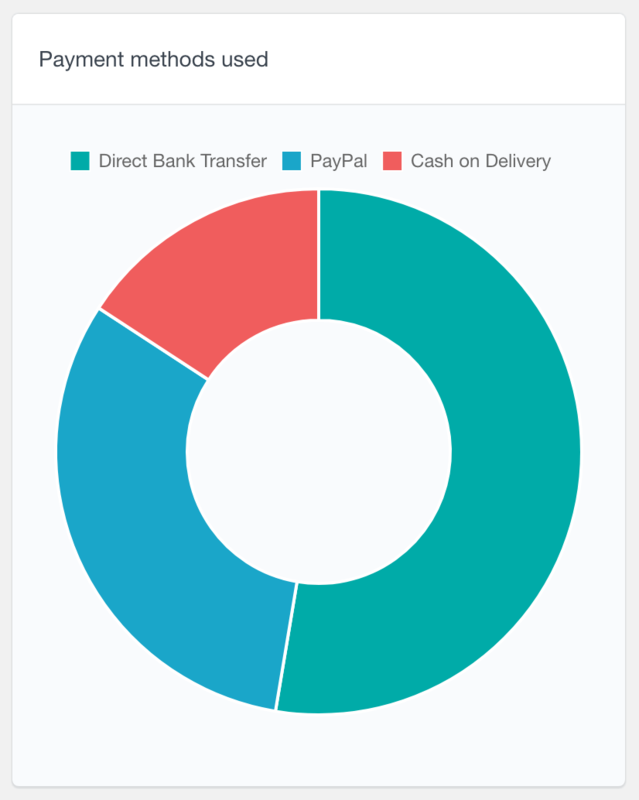 The Payment Methods is a pie chart report showing the percentage of each payment method used. The payment methods are automatically retrieved from the WooCommerce order data. This means that if you introduce new payment method, it will be automatically detected as soon as your customers start using it. This report can help you make decisions based on the most popular methods used. For example, if you find yourself overwhelmed by having too many payment methods to manage, this chart can help you decide which ones are the most important to keep. Or if you find that most of your customers prefer online payments (instead of cash on delivery or bank transfers), you might consider introducing more online payment options. 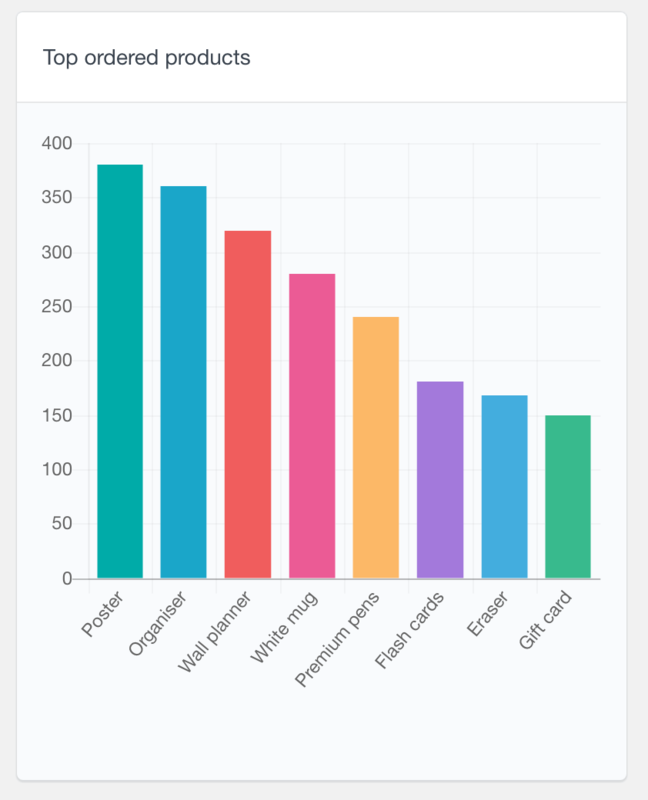 The WooCommerce coupons report shows the top most used coupons in your store. Providing discount coupons can undoubtedly increase your sales and conversion rates, so it is important to understand how they perform. This report can help you find which your more successful campaigns are and what kind of impact they have on your sales. As its name implies, this report shows the top most ordered WooCommerce products. 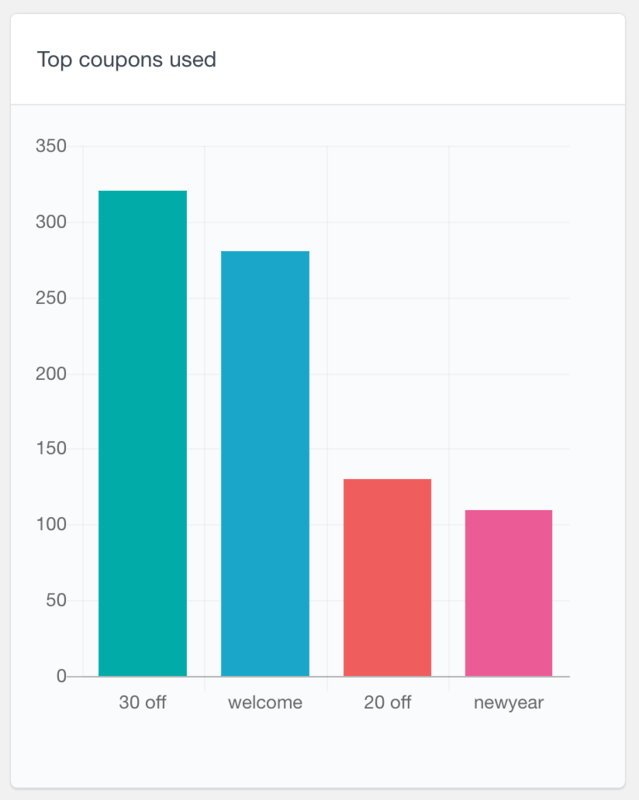 Users Insights analyzes each order’s products and calculates how many orders include each product. This report can help you understand which products your customers are more interested in. 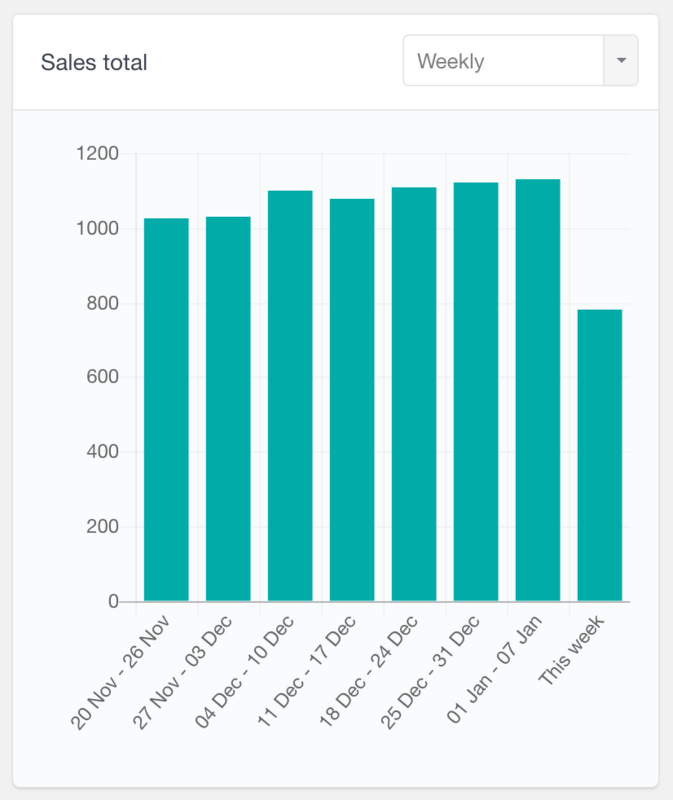 The WooCommerce reports are only a fraction of the WooCommerce module of Users Insights. By combining the reports data with the custom WooCommerce customer filters and searches, you can create a more advanced customer analysis. To learn more, you can visit the WooCommerce module page.